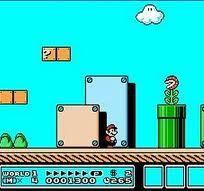 The first three Mario games were released for the NES and would pave the way for a legacy of other games to come. These games are classic platformers, jump and stomp on enemies, or kick koopa shells into enemies. Either way, the Mario games on the NES revolutionized the gaming industry, and continue to innovate even today with titles such as Super Mario Galaxy 2, or New Super Mario Bros Wii. So join Mario on his fantastic adventures into the one of the first gaming systems, and, with the help of a friend in 2 player mode, rescue 8-bit Mushroom kingdom from Bowser's evil reign!